50 years ago this week, Martin Luther King Jr. was assassinated in Memphis and the inner city of Washington DC erupted with pent-up rage. Police cordoned off the mayhem so it didn’t spread to white sections of the city, but whole neighborhoods were destroyed. In the Adams Morgan district, rioters spared the Potter’s House, which had been open since 1960. Church of the Saviour was one of the few integrated churches in the city, and after the riots, the Potter’s House became the locus for many efforts to address results of institutional racism along Columbia Road. Church of the Saviour was known for its many and varied missions. Seekers Church grew out of FLOC (For Love of Children), which was formed to close down Junior Village — an overcrowded dumping ground for black children whose parents could not take care of them. Our founders, Fred Taylor and Sonya Dyer, were actively involved. Fred was the executive director FLOC and Sonya, a leading volunteer. In some ways, the riots of 1968 and the mission of FLOC are stamped in our spiritual DNA. Many of the early members of Seekers were involved in some form of child advocacy, and within the CoS family, we had the reputation of being “the children’s church.” But over time, Sonya would identify our charism as ART and ADVOCACY, not one particular mission. You can see that in our altar, bulletins and conscious liturgy. We supported ministry in daily life, because so many Seekers were involved in advocacy. That made us different (or odd) within our family of faith. We didn’t quite belong. What if these three women had kept their silence forever? Had never told anyone what they saw and heard inside that empty tomb because they didn’t belong to the inner circle of disciples? Do you think we would we be celebrating Easter now? Suppose the story of Jesus ended with his ghastly death on the cross. In spite of all his teaching and healing, do you think Christianity would have emerged from Judaism? Suppose his disappointed followers had simply gone back to their nets, back to their homes and nondescript lives. Would we be here today? I think not. Something happened to empower those frightened women. We call it resurrection. I’m guessing that the women did not stay scared and silent, overcome with “terror and amazement.” Maybe they told no-one until their experience was confirmed by other sightings. Perhaps the couple walking toward Emmaus came back to Jerusalem to share their story – and then women found the courage to tell what they had seen. Maybe this was an early #MeToo moment. We’ll never know, because this is not an eye-witness account. It’s a remembered story, told and retold, before it was written down by the author of Mark, a generation after Jesus died. Something about this account helped the earliest disciples deal with Jesus’ death. It helped to explain the mysterious transformation that made his frightened followers into courageous leaders in a hostile environment. As they told and retold the stories of glimpsing the risen Christ, those early followers, women and men, were gradually filled with a new kind of call. They themselves became good news for the outcast and overlooked people at the margins of society. Like many of you, I have been depressed and discouraged by repeated school shootings in the past few years. We seem so powerless to stop the spread of guns and the shredding of our social fabric. Along with President Obama, I wept for the innocent children at Sandy Hook. And I was sickened by the Pulse nightclub shooting. Other incidents of police shootings and violence against transgender youth have threaded through these mass shootings until I hated to see the next newspaper. I didn’t see the connection with our gospel reading for today until last Saturday, when the March for Our Lives coincided with Kayla McClurg’s memorial service out at Dayspring. In the morning, we watched – awestruck and amazed at the power and passion of the young speakers at the march. The depth and range of their vision lifted my spirit, gave me new hope that we could find a way to regulate guns — as we do automobiles. Then, in the late afternoon, after scattering Kayla’s ashes with our bare hands, Peter pitched her dried clay urn into the lake, where it would quickly return to its natural state as mud mixed with Kayla’s remaining ashes. That truly marked the end of her singular voice describing Church of the Saviour to others. We were often left out of that mission-oriented narrative. By Saturday night, the voice of Naomi Wadler kept coming back to me. She is the 11-year old girl with big hair and a big voice who named how African American women and girls are overlooked — whose stories don’t make the evening news, even though black women and girls are disproportionally subjected to gun violence. To honor those forgotten females, Naomi added the names of Courtlin Arrington, Hadiya Pendleton and Taiyania Thompson to the well-known list of Parkland students killed by guns at school. Somehow, Naomi’s presence, as well as her words, felt like a bright angel in a crowded tomb containing all those innocent women and girls, shot dead before their lives blossomed into fullness. Something in Naomi’s presence and her message touched my own experience – but I wasn’t able to make the connection just then. In the days since the march, I have felt more hopeful that we can take action to do background checks, raise the age for purchasing guns, and ban the sale of assault weapons and bump stocks. Maybe these young people can wake us up from our numbness. Maybe we can, afterall, do something to make schools and streets and homes safer for all of us, including black women and girls. I’ve been asking myself why Naomi Wadler hit such a chord for me. Afterall, I’m white, privileged and old. We live in a pretty safe neighborhood, and we don’t have a gun in our house. I have no reason to be afraid. But in the middle of the night this week, I woke — remembering a time when I too felt vulnerable and alone in a frightening situation. It was late in the afternoon, on a crowded street, in the red light district of Bangkok, Thailand. I had just visited Peter in a small anonymous hospital, where he was under intensive care after a year in Vietnam. It looked like a really bad case of hepatitis. I was in Thailand alone, without official status of any kind. I didn’t speak the language or know the culture, and I left the hospital feeling completely helpless. I was waiting for the next bus to come along when two half-drunk American GI’s began to hassle me, pawing and pulling me toward a nearby bar. I had no idea what to do, so I planted my feet and stared at the ground, too scared to fight back. As the men got more insistent and threatening, I noticed a shift in the crowd of Thais waiting for the bus. Without a word, I felt the pressure of warm bodies around me, surrounding me on all sides. The men were hemmed in too. And when the bus pulled up, the group around me moved onto the bus together, leaving the two men behind. Only then did I begin to shake and feel how terrified I was. Like the women who went to the tomb where Jesus lay buried, I had gone to that hospital with my own grief and fear. But my experience at the bus-stop, of being saved by a silent crowd of slim brown people, gave me the courage I needed to walk thru the next weeks and months of his hospitalization, without knowing what the future would be for him or for us. Without words, they gave me hope. Naomi Wadler’s passionate message spoke for me too. I think that’s how faith forms. First, there is a bodily experience. We expect one thing and something else happens. We gather our spices to do the dutiful thing and find the tomb empty. We go about our daily tasks and something unexpected jolts us awake. Riots break out in the city. Ordinary people do courageous things. Students speak out against gun violence. Adults decide to vote or run for office. Then we find language to make meaning of our experience. Over and over the gospel writers tell us that the disciples did not understand what Jesus was saying. But then, when confronted by the empty tomb, they began to re-member. Make connections. Experience Jesus in a new form, as “the risen Christ.” And that’s why we read the Bible or come to church – to hear the stories that will give meaning to our own experience when it happens — to name resurrection and bear witness to life in the midst of death and discouragement. Language allows us to put events into a context, to see meaning over time. Finally, we practice symbolic forms together. That’s how experience gets shared in community – through ritual and story. 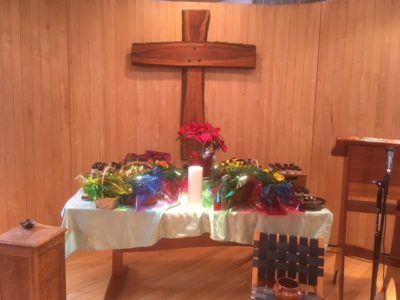 When we celebrate communion, we not only recall the ancient story of Passover and release from slavery, but the story of crucifixion and resurrection as well. When we break the bread [touch], it shows how the presence of Jesus was broken apart and shared by his followers. They too become the good news of God-with-us. It’s the question I’m carrying about Church of the Saviour right now— how to tell our collective story today, in many voices. How to celebrate who we are now. And the cup [raise cup], the wine recalls the spiritual presence of God-with-us, available to all. So when we eat this bread and drink this wine, we step into the empty tomb with the three women. We know from the story that there is a chance that some bright angel will be there, speaking hope in the darkness. Resurrection is not about a resurrected corpse. Resurrection transforms Jesus to a new existence that enables him to be present in our lives. As Spirit, Jesus lives again in us, through us, calling us to act, to speak, to dare stand against tides of apathy or fear.